Hello everybody! We’d like to keep dhtmlxSuite users informed about what is going to be released in future updates, what improvements and integrations we are working on now. One the one hand, dhtmlxSuite library seems to be full-featured and powerful enough to meet the requirements of business application development, on the other hand, the modern world doesn’t stand still, and DHTMLX needs to follow up the technologies as well. Considering this, we are preparing updates of Layout and Form, the essential components of the Suite library. Moreover, we started preparing samples of AngularJS 2 integration, and are going to provide more samples that show server-side integration (PHP, Node.js, ASP.NET). The development of web applications structure will become simpler and more flexible: dhtmlxForm and dhtmlxLayout are going to be fully updated. It’ll bring them that responsiveness and flexibility that many of you’re looking for. If you are already using these controls, don’t worry – the updated form and layout will be backward compatible. We are happy to inform you that the examples of using our UI library with the most popular server-side platforms are on their way. 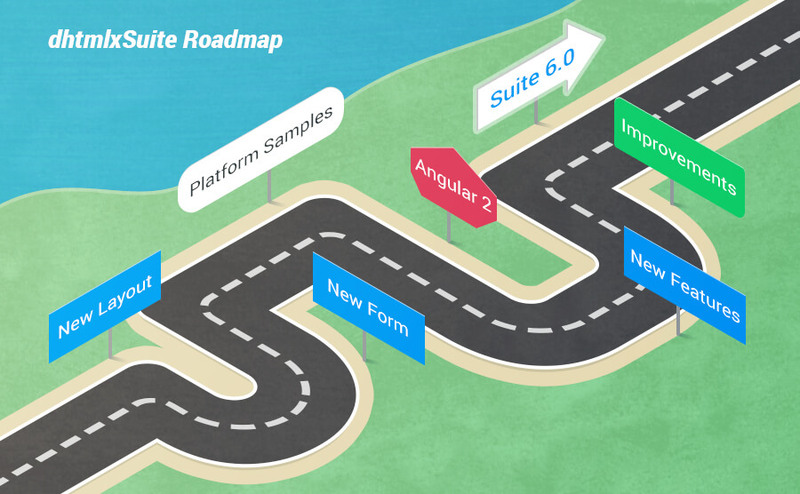 You’ll get a set of ready-to-use samples that are already integrated with PHP, Node.js and ASP.NET platforms, so all that will remain to do is to grab them into your application. It’s just a part of updates that we plan to add to the library. We are going to provide you more detailed plans and release dates as soon as possible. Stay tuned! server-side integration (PHP, Node.js, ASP.NET). Interestingly, for examples, perhaps you have forgotten JAVA? Thanks for your comment! :) We’re planning to provide PHP, Node.js and ASP.NET samples first, then we’ll think about other server-side technologies (maybe we should take a survey to learn the most demanded ones). Any updates Standard Edition version? All these updates will be included in the Standard Edition as well. Is the Trello Roadmap posted months ago – is some of the features being worked on. Please provide us an update – it would be helpful atleast to provide us with a tentative list of up coming features and release schedule – this would greatly help us plan our implementations. Hi Kris, thanks for your comment. We’ve updated the roadmap on trello, though some features that are marked as “wishes” are still in the wishes phase. The main aim for now is to update the components (form and layout) so that the adding of new functionality would be more reasonable. Any plan for making possible transactional records, using the grid o form library? like row by row accept code and bring name of item, price, etc.? We plan to release dhtmlxSuite 5.2 until the end of the year, so Suite 6.0 moves to 2018. We plan to release dhtmlxSuite 6.0 until the end of this year.